FILE - Afghan security forces take position during a gun battle between Taliban and Afghan security forces in Laghman province, Afghanistan, March 1, 2017. But corrected figures, provided by the U.S. military and published Tuesday by SIGAR, suggest that the actual decline was 17,980. Pentagon officials acknowledged originally providing inaccurate figures to SIGAR because of a failure "to account for the transfer of most of the Afghan Border Force from the Afghan National Police to the Afghan National Army," according to a SIGAR statement. According to the new figures, there were 313,728 members of the Afghan defense forces as of January 31, 2018. That compares to a total of 296,409, as previously reported. "SIGAR receives all of the (Afghan National Defense and Security Forces) personnel strength numbers published in the quarterly report from USFOR-A and has no means of independently verifying them," the statement added. The new figures still amount to a sharp decline. Afghan forces suffered unprecedented casualties in 2017, reportedly losing about 10,000 personnel, according to reports. SIGAR has been unable to publicly disclose the exact number of Afghan forces killed, because that information continues to be classified by Washington and Kabul. The violence has led to increased reports of Afghan military desertions, but that information too has been classified. FILE - Afghan security forces arrive at the site of a suicide attack in Kabul, Afghanistan, March 21, 2018. Senior U.S. military officials repeatedly have acknowledged the nearly 17-year-old conflict remains a stalemate, even while touting some successes under the new strategy announced by President Donald Trump in August. 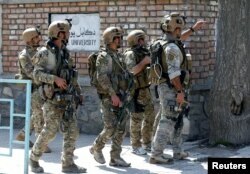 Those success include the increasing capability of the Afghan military, which began conducting airstrikes two years ago. The Afghan air force carries out between four to 12 airstrikes every day, according to the Afghan Ministry of Defense. But the Kabul government controls just over half of the country's districts, SIGAR says. Trump's strategy appeared to commit the U.S. to Afghanistan indefinitely. It involves pressuring Pakistan to end its support for Afghan militants, supporting Kabul's effort to engage the Taliban in peace talks, and dropping more bombs on the country. The U.S.-led coalition in Afghanistan dropped more bombs during the first quarter of 2018 than it has in the same period in any of the last 15 years, according to a VOA analysis of monthly data released by the Pentagon. The violence in Afghanistan is expected to worsen as fighting picks up during the warmer months. The Taliban recently announced the start of its annual spring offensive, rejecting Afghan President Ashraf Ghani's offer of peace talks without preconditions. Islamic State also has carried out numerous high-profile attacks. This story is an updated version of the original published May 1. It has been adjusted based on new information provided by the Pentagon.